Some time ago I brought up the issue of technological progress and magic. The gist of post was a contemplation on why most of “fantasy” settings seem to stuck in perpetual middle ages. The obvious in-universe answer is of course “because wizards”. After all, who needs expensive and unreliable steam engines if you have magical portals and flying carpets? Why would you go to trouble of arming your army with muskets, when even an apprentice mage could cast “invoke dampness” spell over the battlefield rendering gunpowder weapons unusable. One interesting assumption we were making in that thread is that for some reason magic only becomes relevant at the cusp of industrial revolution and not a day earlier. While it does make perfect sense that it would retard the development of of gun powder weapons and steam engines, it does not explain why it wouldn’t have the same type of chilling effect on all prior technology. For example, medieval metallurgy, masonry, architecture, husbandry and agriculture were all pretty vibrant and dynamic fields without which we wouldn’t see castles, plate armors, mounted cavalry and any other fantasy staples. But these fields never seem to be affected. So we must conclude that magic is irrelevant to these fields (which is silly, because we know you can make enchanted armors, flying castles and etc..) or it only becomes prominent after these mundane technologies are already well established. Naturally, we know the meta-narrative reasons for this: we enjoy stories about knights, wizards and dragons and so we construct the worlds in which they can exist. That’s a given. But when we talk about in-universe logic, we must assume that magic is simply discovered and popularized late. Here is a thought experiment: what if it wasn’t? What if “magic boom” happened not in the middle ages but way back, at a tribal hunter gatherer stage? What if tribal shamans were able to achieve the kind of power level as Fantasy battle mages? How would access to that kind of magic shape the society, and how it would affect the development of technology? And just to make things more interesting let’s say we are not talking about humans here. 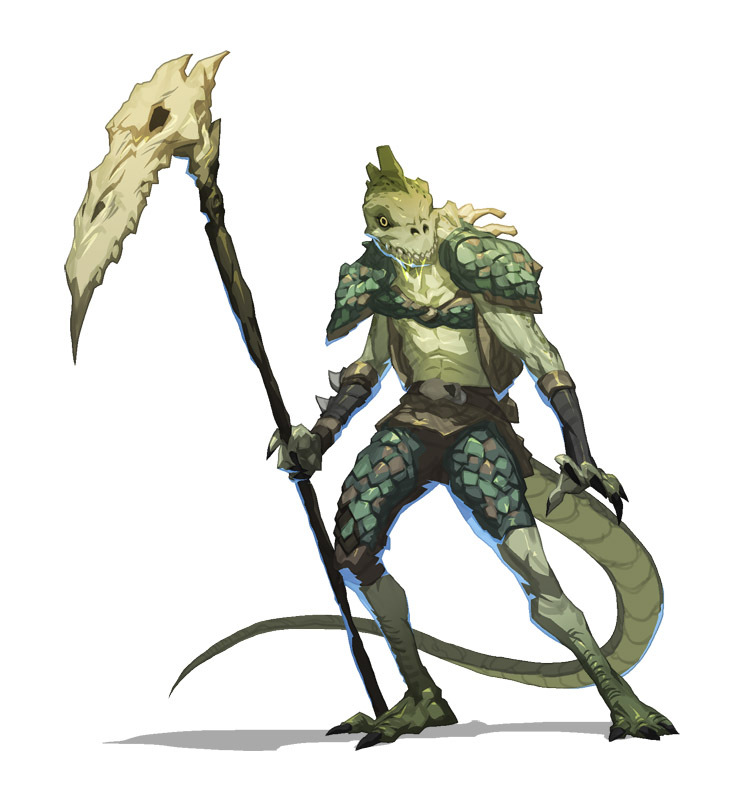 Let’s take Fantasy’s quintessential, low-tech, cave dwelling species: the Troglodytes (also known as lizard bros). Let’s establish some background here: Troglodytes start their civilization as just about any other species. They are cave-dwelling, hunter-gatherers who just recently figured out how to make primitive tools out of stone and bones of their prey, but not much else. There are probably other sentient species in the area, like Gnolls, Kobolds and maybe even some Humans that are at about the same technological level. Sometimes they trade, sometimes they fight, other times they ignore each other. Then, Troglodyte shamans discover magic and everything starts to change for the better. At first the changes are subtle – the healing and combat magic gives them an edge in battle against their more territorial neighbors and so their communities grow and prosper. Soon Shamans discover that magic can not only be used during the times of war, but that it’s real utility comes into play during peace. Instead of spending days gathering fruit and nuts in the forests, the Shamans can simply make those plants grow in and around their settlements. 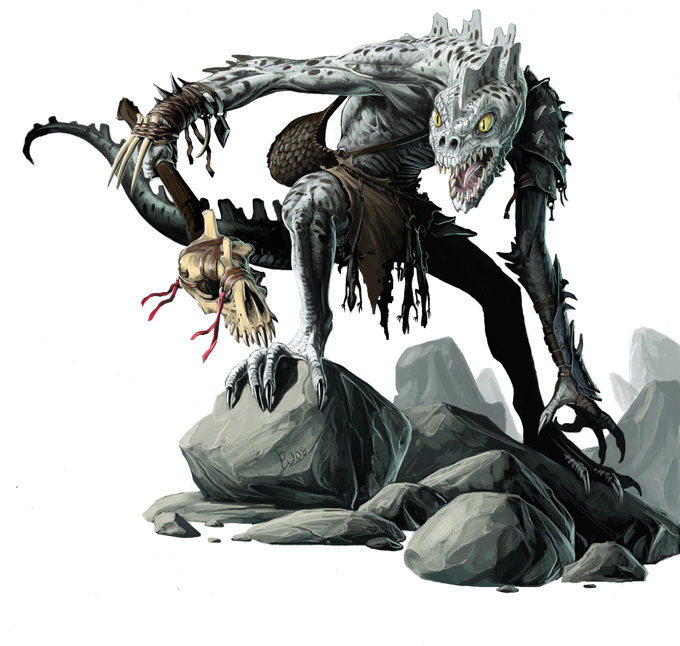 Instead of spending days tracking beasts of prey, magic can be used to lure them into traps or simply have them walk into the Troglodyte village and lay down waiting to be slaughtered. 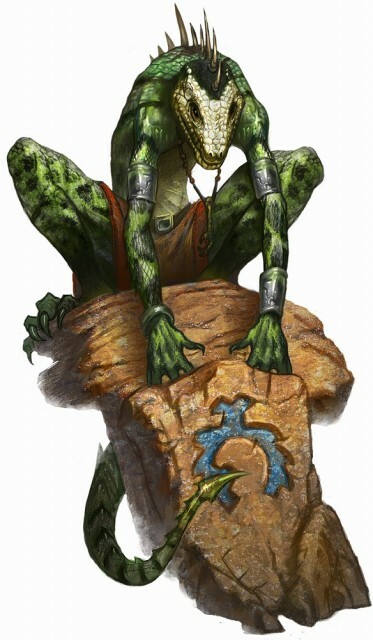 Magic also frees the lizard men from dependency on natural cave systems for shelter. They can now drill out houses in the stone, or burrow in the ground as they please. As this knowledge spreads from community to community there is a good deal of social unrest. The hunters caste are very upset that they are being made irrelevant. They are very concerned that their professions will disappear the same way the “fire keeper” caste did when the magic users learned how to light and extinguish fire at will. At the same time the Shaman’s can barely keep up with the demand for their services: the communities start to rely on them for everything. They are healers, builders, warriors, food providers, community leaders and etc. The shaman caste realize that further growth is unsustainable. Their magic is helping their communities to grow and prosper, but as they do, the shaman are being spread thin. After much deliberation, they decide to invalidate and beak the vows of secrecy surrounding their craft, and teach it to everyone willing to learn. Luckily it turns out that Troglodytes are all attuned to magic: it flows freely through their bodies and almost all of them can use it. And so hunters learn spells and incantations that let them lure, distract and control prey. Gatherers learn magic that allows them to influence plant grow, and tend wild gardens outside their cave villages. Builders study magic that allows them to crush, sharpen and move stone and earth to create tools and living spaces for the Troglodyte communities. Warriors study enchantments that will make their natural scales harder than stone, and make their wooden or bone spears unnaturally sharp. The former shamans take a back seat an assume a role of teachers and keepers of knowledge which they share freely with others. Few generations pass, and the caste systems of old are all but forgotten. Most Troglodyte communities are now societies of specialized wizards. Where other civilizations turn to mundane technology, they simply use magic. When Gnolls develop bronze tipped javelins, Troglodytes simply enchant their bone spears to fly further. When humans start making weapons and armors from iron, Lizard men simply beef up their protective spells, and develop armor piercing incantations. In a way they can work faster than their neighbors because harnessing mundane technology takes years of research, practice and require raw materials. Spells on the other hand are basically just focused thoughts which can be disseminated immediately after being developed. While other species develop complex writing, and graduate from stone tablets to paper based media, Troglodytes stop at a fairly simple system of glyphs suitable for carving them in stone or bone. They use it mainly to make sign-posts, labels, record names or for decoration. They don’t write books, or codify their stories because they have better ways of preserving knowledge using magic. The most common method of preserving knowledge or experiences are memory charms, usually made by enchanting skulls of small animals. The creator of the charm can imbue it with thoughts, emotions and memories and it will act as permanent storage device. Anyone can access the stored memories by simply touching the charm to their forehead (though some charms can be protected by a password that has to be whispered to unlock them). Compared to bound paper volumes produced by humans, memory charms are both inexpensive, trivial to produce and easy to use. To facilitate the exchange of knowledge, as well as better resource management Troglodytes also develop a mass-transit system in the form of Way Stones. They are created by taking a massive stone slab, binding it with strong magic and then cleaving it in half. Anyone stepping on one half of the stone is ten magically transported to the other one. Communities wishing to establish a permanent trade link typically create a Way Stone pair, and then mark them with appropriate glyphs so that travelers can know which village it leads to. Not all Troglodyte communities are connected to each other, but most ave at least one or two Way Stones that link them up to some of their neighbors creating a vast network of connections. Way Stone network allows the Troglodyte communities to specialize and grow in very peculiar ways. Because food and resources can be transported instantaneously between Way Stone connected locations there exist communities that produce no food or resources locally and simply trade for them with neighbors. This allows Troglodytes to live deep underground or in otherwise inhospitable areas such as desolated wastelands, magical swamps, or even underwater in magically sustained air bubbles. No one really knows the extent of the Way Stone network as there exist no accurate maps that would include all the stones. After a few centuries of growth, the Troglodyte civilization is assumed to have over a thousand active nodes all over the world. Most communities only know the layout of two to three hops away from their home village and new Way Stones are created all the dime connecting new and established communities. Most traveled Troglodytes can probably tell you the shortest way to their Capital City (shortest in the sense of fewest Way Stone hops not actual real world distance). To other races, Troglodytes look like primitive savages. They wear almost no clothes, and their tools are made almost elusively from wood, stone and bones. Those who trade with them note that they seem to be profoundly disinterested in anything made out of metal – including weapons, tools, armors and even jewelry. The truth is that they have no need for these tings because most Troglodytes knows a sharpening spell that can temporarily turn a bone staff into a razor-sharp weapon capable of cutting through a plate armor. They don’t use bows and arrows, because they put homing spells on their spears extending their range, and ensuring they always strike their target. They build no houses, because they can drill shelters directly into mountainsides, complete with stone shelves, stools and other furniture built directly into the interior. Where they have no rocky surfaces to work with, they dig underground or weave trees and vines to create spacious halls and huts for the citizens. Their capitol city is said to be hidden deep in some inhospitable swamp jungle. It is said to be a gigantic cave city drilled into the sides and throughout an ancient mountain. It is said that every inch of the mountain has been carved by magic, and that from afar it looks like a cross between a stone anthill and an ancient pyramid temple. Those who have visited the Troglodyte communities usually remark on how in touch with nature they seem to be. Those who lived among the Lizard Men usually quickly realize that this is not true. They exploit the nature to their own ends just like most other sentient species – their excesses simply do not look like conventional agriculture. The capitol for example is incapable of supporting it’s population with local resources, and so there exist many “hunting” communities that make a living hunting and gathering for the capitol and delivering food in bulk. Their daily “pulls” of game can easily deplete the local ecosystem within weeks, at which point they pack-up their Way Stone and move to another area. 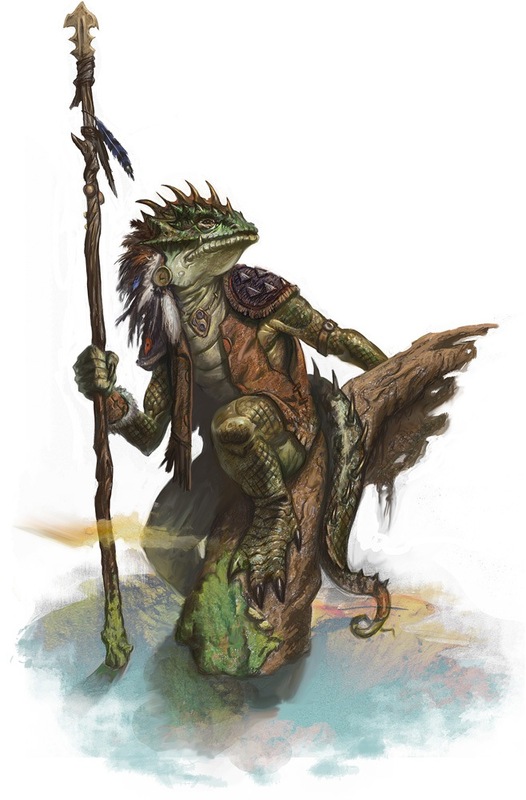 And there you have it: a race of primeval lizard people who appear primitive, because they rely on magic for all the things we usually use tools for. All the modern comforts are provided by means of enchantments and spells which sharpen bone knives, or make stone soft and warm enough to comfortably sleep on. My Troglodytes are different. What do you think? Brilliantly logical. I like the idea. But maybe there could be a new evolution. Rather than having temporary spells changing the attributes of matter for one or two uses, the shamans could discover permanent spells and enchantments modifying the very aspect and nature of substances. That stone that you magically “soften” each night to sleep is practical, yes, but it is ugly. Some shaman could create a permanent enchantment which makes it permanently soft and cozy and looks awesome as well. And here you have a new “revolution” in your all magic society: magically crafted objects and materials. Your Troglodytes don’t look basic and rough any more: they will appear as demi-gods to outsiders, wielding non-metallic, yet unidentifiable (because magic) materials. You make this magic system sound like it doesn’t involve much in the way of research, which is good since they don’t have a whole class to devote to research as hunter gatherers. But, without research and the minimal complexity of casting/enchanting has consequences. It is reasonable to assume that the troglodytes would potentially have access to their most powerful of spells immediately, or that each new threat that caused them to re-evaluate would potentially reveal their most potent versions. It would severely disrupt any equilibrium with other races, should the lizard folk decide to aggro. Now, if your magic requires research and a number of people that don’t actually contribute to the group survival I think you’ll end up with some amount of engineering. You’ll need to have an entire class make their contributions to society indirectly. That doesn’t mean only medieval times though, it seems like the Egyptians had a class of people that did not directly support their civilization. If not Egypt then certainly Greece. so you have reptilic wood-elves? doesnt seem that new to me. Heh, that’s actually pretty interesting. Could such a society “industrialize” itself via magic? Or is magic always a halting force that keeps the societies in stasis? I kinda envisioned Troglodytes as more of a reactive race which is excellent to responding to external stimuli and adopting their magic to their needs, but perhaps being a bit slow taking it into abstract directions. So I figured they find spells that work for them, and then they stop tinkering with them until something forces them to adopt. I figured the former shamans took the mantle of being teachers, keepers of knowledge and researchers. The general population sort of learns the spells relevant to their work or needs, whereas the sages develop, improve and preserve them for future generations. Well, I guess it depends on which version of “wood elves” we are talking about, but I guess yeah. I never really claimed these are supposed to be 100% unique, original ideas. I guess they do end up being similar to elves in many ways, but I think I started at a different place with them and the logical progression from that point is there in the text. I think a problem with this is proliferation… if the magic is easily learnt by other races why would they resort to technology either? An easy tho rather trite answer is that there is something special about these lizard folk that allows them such easy access to magic… that the magic goes down to their bones… and this is part of why they are so reculsive, as that in the past other races learnt that the troglodyte didn’t have to be alive to continue channeling magic in this fashion… the black market in troglodyte goods with troglodyte bones lashed to them to enable their function is rampant as it is disturbing.